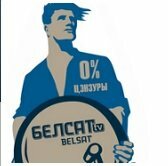 General TV Channel / Belsat TV is a satellite television channel aimed at Belarus. It is intended to provide an alternative to the censorship of Belarusian state-run television. Its slogan is "Belsat - your right to choose". The channel broadcasts in Belarusian and Russian, and is intended to provide entertainment and news of a standard comparable to the major TV channels of East-Central Europe. Belsat is run under the aegis of Polish state-run television company Telewizja Polska (TVP), and is based primarily in Poland, where there is a significant Belarusian minority. It started broadcasting on 10 December 2007. The channel is run by about 70 journalists located in Poland, Belarus, and Lithuania. The President of Belarus, Alexander Lukashenko, has called Belsat a "stupid, uncongenial project".